Your boiler reaches running temperature fast and efficiency is increased by using a load unit like a Laddomat heat charger. 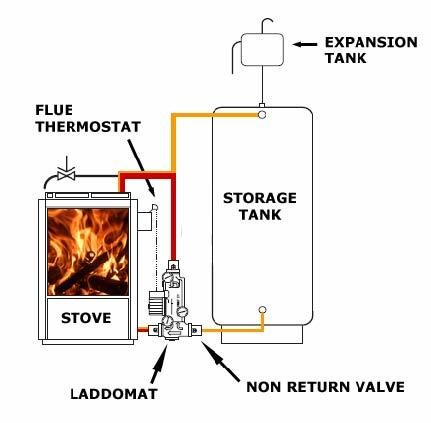 A Laddomat heat charger helps to make sure that your stove with a backboiler runs as efficiently as possible by: ensuring that the stove reaches and maintains a high working temperature quickly and by encouraging good stratification in your heat store / accumulator by slowing the flow rate to the store. The Laddomat 21 suits stoves with backboiler outputs of up to 30kW (most stoves and many log boilers). Stoves run most efficiently once the firebox has become hot - temperatures of 300+ in the firebox promote the efficient combustion of logs. This temperature is often reached only after the first firing cycle, and this is where stoves with back boilers can run into problems. One might think that the best way of getting the maximum heat to the water would be to extract as much heat as possible from the fire, but paradoxically this is not the case at all. Extracting a lot of heat directly from the firebox will lower the firebox temperature, reducing the burning efficiency. Most stoves with back boilers have the back boiler inside the firebox which that means that the firebox temperature and therefore combustion efficiency are reduced - especially whilst the water in the heating circuit is still cool. This is especially true of log burning stoves as wood needs to be hot to burn efficiently, and is less true for stoves burning coal. The Dunsley Yorkshire is a stove which goes part of the way to overcoming this problem by clever siting of the backboiler, but even this stove would benefit from a Laddomat heat Charger. The Laddomat 21 heat charger is a clever solution to this problem. By circulating the water from the backboiler through a very small circuit the Laddomat ensures that it reaches a high running temperature very fast. The heat charger then releases heat from this circuit into your heat store (or other heat sink such as radiators) whilst maintaining a high temperature in the backboiler. The Laddomat heat charger is plumbed in between the stove and the heat sink(s) as shown in this very simple diagram. In this case the heat sink is a heat store, but it could also be radiators, hot water tanks, etc. 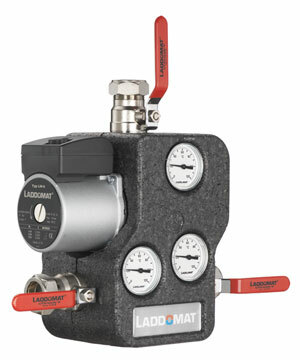 The Laddomat is essentially a series of temperature control valves and a pump. The valves and pump in the heat charger circulate the water through the red circuit (as shown in the diagram) until it has reached 72 degrees. The water in the red circuit quickly reaches 72 degrees because the red circuit only contains a small volume of water which is quick to heat. The firebox temperature therefore reaches a higher temperature much faster as the water entering the backboiler is now at around 72 degrees, which promotes more efficient combustion of the wood. A non return valve between the heat sink(s) and the Laddomat heat charger stops water from the orange circuit (shown in the diagram) entering the red circuit during the warming cycle. Once the the red circuit is up to temperature the heat charger gradually allows water to flow to the heat sink(s) through the orange circuit. It does this in such a way as to keep the temperature in red circuit at a roughly constant 72 degrees. A thermostat on the flue pipe of the stove ensures that the heat charger is only switched on when the flue pipe is very hot (ie when the stove is going). This keeps electricity use and wear to the pump down by only switching the Laddomat on when it is needed. When the fire dies down the flue pipe temperature quickly drops and the Laddomat heat charger switches off. Heat then circulates to the heat sink(s) via thermosyphoning through the orange circuit. The water in the back boiler of the stove very quickly reaches a high running temperature which means more efficient combustion. In a system without a heat charger the water would take a very long time to reach 72 degrees, if at all. Efficient combustion is promoted throughout the burning cycle because the water in the backboiler remains at this high temperature throughout the burning cycle. In a system without a Laddomat heat charger the maximum temperature is often reached very slowly and is often relatively low, or some other systems mean that the temperature oscillates between hot and warm as thermostatic pumps turn on and off. The flow rate to the heat sink(s) is kept to a minimum - this is vitally important for the efficient use of a heat store. Without the Laddomat the flow rate to the heat store would be much higher, thus mixing the hot and cold water in the heat tank. With the lower flow rate mixing is reduced and good stratification occurs. Heat stresses and damage to the back boiler are kept to a minimum. This happens in systems not using a heat charger, where a pump is controlled via a thermostatic switch - the water coming to the thermostat reaches 70 degrees and the pump then comes on flooding the hot back boiler with much colder water. This can reduce the lifespan of the back boiler. The Laddomat heat charger stops this happening because of the gradual opening of the valve to let only excess heat out into the heating system, whilst keeping the water in the back boiler at a high operation temperature. If there is a power cut or if the pump fails, the heat charger allows heat to circulate through the orange circuit by thermosyphoning. It is as if it were not there. The Laddomat has wide bore valves to facilitate thermosyphining. Ball valves mean that you can isolate the Laddomat (for servicing for example) without the need to drain the entire system. The Laddomat Heat Chargers can also stop the stove acting as a radiator when it is not going. This can occur in linked heating systems.